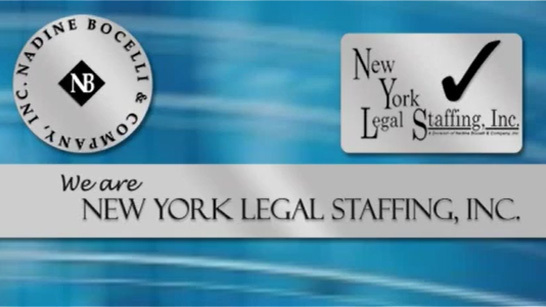 Litigation Legal Secretary/Legal Assistant – Nadine Bocelli & Company, Inc. – New York Legal Staffing, Inc.
National law firm is looking to hire a bright, motivated and enthusiastic litigation legal secretary for its midtown Manhattan law office. Duties will include: editing pleadings including TOAs and TOCs; proofreading legal documents; e-filing; calendaring and other administrative responsibilities. Must be proficient in Windows 7 and with Microsoft Office 2010 including MS Word and Outlook. Excel and familiarity with a document management system, i.e. DocsOpen, Worldox, iManage, Filesite, Net documents. Minimum of 2 years of legal secretarial/ legal administrative experience. Undergraduate degree required. Collegial and supportive environment. Competitive compensation and benefits. Due to the volume of applications that we receive, please do not complete more than one application or upload your resume to multiple listings. However, you may reference additional job numbers of interest under “Comments” noted above. Your resume will be considered for any current or future opportunities.